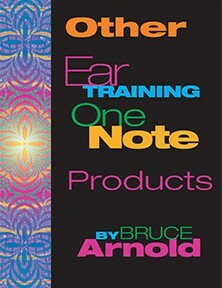 The different Ear Training One Note™ books that are available. Because musicians are coming to this ear training with so many diverse backgrounds and abilities over the years we have created a lot of different books to help them get the method that is most beneficial given their current ability. Of course this can’t be a perfect system because frequently a student isn’t even aware of their own strengths and weaknesses. But we have done our best to give all students books and audio files that will help them target their problems without wasting time and money. Because “key center” based ear training can be a completely new idea to even advanced musicians, we always feel that the best idea is to start from the beginning so that no crucial details or concepts are overlooked. The most common problem we have is from musicians who “think” they have more advanced ear training skills than they actually have, or think that knowing about ear training is the same as having the ability to simply hear. It has also been common for students to start at one level and realize they need to go to a higher or lower level. Based on these years of experience we have tried to create a path through our ear training method that takes all of this into consideration. Let’s first talk about how you will be doing this ear training. We have found that the best way to do this ear training is with an MP3 player. It allows for many more ways to organize the audio files and is very portable. We do offer physical books and CDs with with some of our ear training products but we HIGHLY recommend you not take this path with our ear training method. Digital downloads are a much better way to study this ear training because MP3s are much less expensive, easier to organize and cost half as much as physical books with CDs. Because they are more portable you can take them just about anywhere, giving you that much more access to practice time. We also have many ear training products that are ONLY available as digital downloads so it just makes more sense to go the digital route. So unless you REALLY only can use a CD player we sincerely recommend that you buy digital downloads of our ear training products. 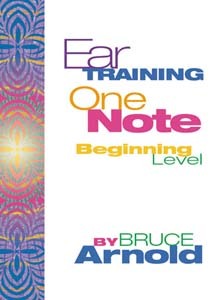 Before we get started with the other One Note Ear Training Books that are available we just want to say that we recommend Ear Training One Note™ Complete because it contain three levels of exercises: Beginning, Intermediate and Advanced. This ensures that you can find the appropriate level to start on without having to re-purchase another book if the one you bought is too easy or too hard. Please keep in mind that you may be an advanced musician but have severe ear training problems or a beginning student with excellent aural skills. This is why we recommend the Complete version. You move from one level to another as you get 80% correct answers. All three levels give you the same exercises. Each level doubles the speed of the exercise thereby making it twice as difficult. Some customers may prefer to take an incremental approach to this ear training method. We have also found over the years that for many reasons customers may prefer an incremental approach to getting involved with this ear training method. To satisfy this we have broken the Ear Training One Note™ Complete book up into 3 different books. While not the most cost effective way to approach this ear training it can be advantageous to the advanced student that just wants to dive into the most advanced part of the One Note Method. 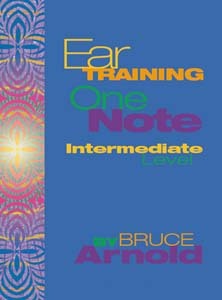 Ear Training One Note™ is available as three separate books which can be digitally downloaded or bought as physical books. 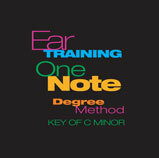 Ear Training One Note™ Beginning is recommended for any customer that has no previous musical training. 34 page PDF with 99 MP3s. Ear Training One Note™ Intermediate is recommended for anyone who has some previous musical training, understands the basic building blocks of music, how scales are built, the 12 notes that are used in western music and knows the names of all 12 pitches. 34 pages with 1 CD of audio files with physical version and 1 CD in MP3 format with digital version. Ear Training One Note™ Advanced is for a musician that has a strong background in music and is an intermediate to advanced player, who has a good background in music theory and can easily process the relationships of all 12 notes within a key center. Super Advanced Levels of One Note Ear Training are also available. We have also created two super advanced level of One Note Ear Training which we recommend to use after you are getting 80% correct answers on the Ear Training One Note™ Advanced exercises. These advanced files have a few unique features that are not available in the Ear Training One Note™ Book(s) previously mentioned. They test you in both a major and a minor key center. The “Degrees” advanced level asks you to name degree names rather than note names. The “Extreme” advanced level plays the exercises twice as fast as the Ear Training One Note Advanced level. These two additional exercises are only available as digital downloads. 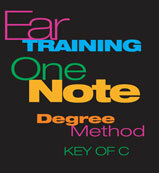 Ear Training One Note™ with Degrees. The digital download below will give you 86 MP3s that quiz you with One Note Ear Training in a major key center but ask you to respond with the degree of the key center rather than the note name. There is another set of 99 MP3s that quiz you in the same way but with a minor key center. Usually beginning students have a hard time with minor key centers so again wait till you are getting 80% correct answers on the Ear Training One Note™ Advanced files before attempting these exercises. No Book: 86 MP3s exercises in a Major Key. 86 MP3s exercises in a Minor Key. 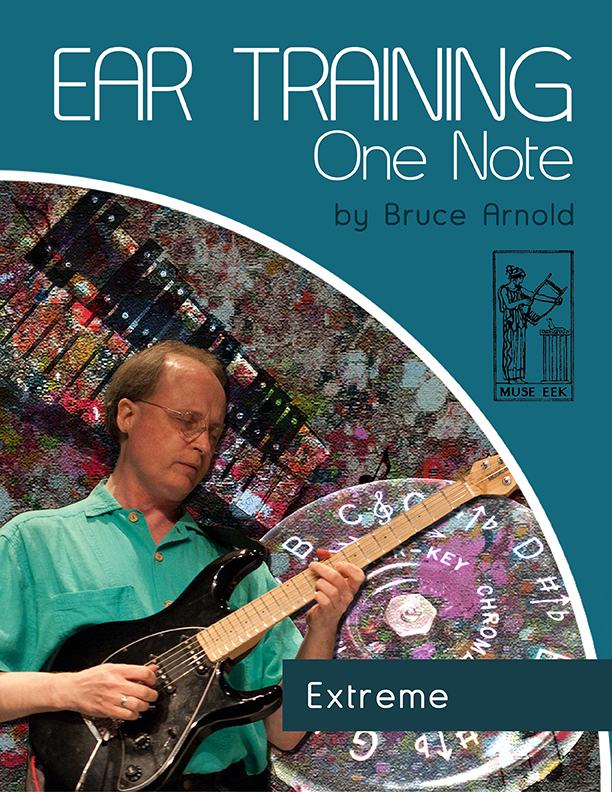 Ear Training One Note™ Extreme. This digital download gives you exercises in both a major and a minor key center but at twice the speed of Ear Training One Note™ Advanced. 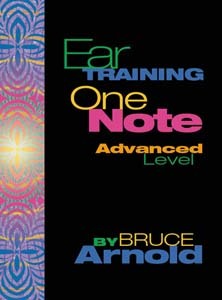 Recommended after you complete Ear Training One Note™ Advanced. Some students can fly through this ear training with no problem. But many musicians need some help. Knowing this, Mr. Arnold offers email support for students as they work through this process. So rest assured as you enter this ear training method that you are not alone, and you can get expert help if you run into problems. This method has been helping musicians for almost 20 years now. It’s one of the best selling methods Ear Training systems on the market. Simply put: It is successful because it works! BUT the secret weapon is Bruce Arnold. He is only an email way to help you. If you are a beginning or an advanced student seeking to perfect your skills, you can call on Bruce to help you through this process. My 7 year old son and I really enjoy these materials by Bruce Arnold. We have One Note Complete, Contextual Ear Training, and A Fanatic’s Guide to Ear Training. We have been using One Note Intermediate and Contextual for just over one month. My son loves to do this ear training program, especially “name that note!” We home school, and we do Ear Training One Note™ and Contextual Ear Training as soon as we get out of bed, and then later in the school morning. I also do both programs later in the day, especially when I am working in the kitchen. My son almost always listens in, and sings along, or names the note, even when he is playing in the next room. After just one month, my son can accurately name all 7 diatonic notes, but none of the non-diatonic yet. I can accurately name C, D,G, and B. I can sometimes get A and F, and I hardly ever get E (yet!). For Contextual, both my son and I can sing Root (Do) for all the keys, although sometimes the minor keys do give us a bit of trouble. We can both sing 3 (Me) most of the time, but 3 still needs work. My son was able to sing 3 much sooner than me. I asked him how, and he said he “just knows what 3 sounds like.” As for me, I got every single 3 wrong for over two weeks, and I was doing them at least 5 to 7 times per day! Then one day, I started getting a few of them correct! Then within a few more days, I was getting most of them correct. This system really does work. After listening to the cadence, the sound of the 3 would just form in my mind. We have been singing 5 (So) for about a week. 5 is coming along much faster than 3. Both of us could sing some 5’s right away. We also continue to review Root and 3. This system is really fun to use and its working for us! This entry was posted in Ear Training and tagged ear training, aural training, ear training one note™ by Muse Eek. Bookmark the permalink.